The ever more troubling context of a world in crisis makes us question the authenticity of our everyday life. Contradiction and fragility become thus vectors in our daily trajectory. The Age of the Strange is the concept under which the festival gathers a series of events that propose a return to the natural, seeking for “techno-surrealist” forms of expression. This edition we build a bridge between an uncertain past and a probable future. Born in the American Midwest, nothing in her background destined farm girl Loïe Fuller to become the toast of Europe’s Belle Epoque cabarets, even less to dance at the Paris Opera. Hidden behind metres of silk, her arms extended by long wooden rods, Loïe reinvents her body on stage and enthralls her audiences a little more every night with her revolutionary Serpentine dance. In this documentary workshop – Masterclass with the Creator of MR. GAGA about Dreams and Dignity, Heymann shares the complex artistic choices he made while filming and editing the film, the connection (mostly in the director’s mind) between Naharin’s personal biography and his dance creations that are interwoven in it, the link between art, politics and freedom of speech, and the reasons that made him reopen the film three times after it had already been screened in public and the production phase seemed to be over. 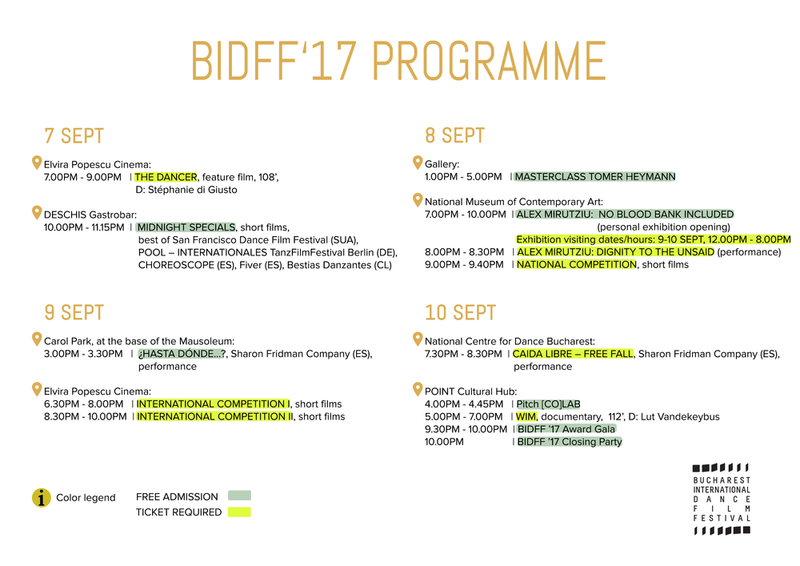 For the first time BIDFF presents a competition dedicated exclusively to the Romanian dance films. 7 shorts have been selected to be part of the competition as they have an experimental approach to either dance or film, bringing to light the creative strength of the Romanian industry and its diversity. The films explore the body-space relationship, different perspectives on the concept of cohabitation and choreographies of the senses. Hasta dónde...? is a contemporary dance duet based on the technique of contact. Rendered to the drift of the body, we began to abandon that which prevented us from being. Drawing on performances, rehearsals, interviews and family archives, Lut Vandekeybus explores her brother's restless creativity - performer, choreographer and director Wim Vandekeybus. Caida Libre explores an essential characteristic of our nature: the survival. Sharon deepens into the way groups are formed to create a support, a physical and emotional net that allows the individual to fall down and stand up again. This intention emerges as a result of the need to find freedom space for each individual within a group. Bucharest International Dance Film Festival 2017 is a cultural project produced by Tangaj Dance Association, funded by The Bucharest Municipality through ARCUB - in the frame of the Cultural Program "Bucharest Participatory City", co-financed by AFCN - The Administration of The National Cultural Fund, with the support of the Romanian National Film Center and the Romanian Cultural Institute.The project does not necessarily represent the position of The Administration of The National Cultural Fund. AFCN is not responsible for the content of the project or for the way the results of the project can be used. These are entirely the responsibility of the financing beneficiary. Partners: Elvira Popescu Cinema (the French Institute in Romania), The National Centre for Dance Bucharest, The National Museum of Contemporary Art, the Embassy of Israel in Romania, the Embassy of Spain in Bucharest, POINT Cultural Hub, Gallery, FranceDanse Orient-Express, Tiriac Auto, Colorgrade, Crama Histria, Brigada de Voluntari.